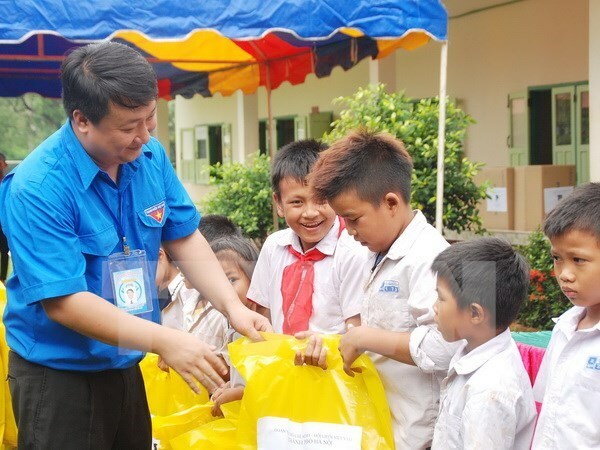 Hanoi (VNA) – The Ho Chi Minh Communist Youth Union’s Hanoi chapter launched a voluntary campaign in Vientiane, Laos on July 1 as part of activities to celebrate the 54th anniversary of Vietnam-Laos diplomatic ties. Joining the campaign are 42 volunteers, including physicians, doctors, agricultural experts and students in youth organisations across Hanoi. During the campaign, which will be carried out with a total fund of over 600 million VND (27,000 USD), the volunteers will work to provide free check-ups and medicines for 1,500 people in Saysettha district, and teach locals how to prevent diseases, injuries and accidents. They will transfer technology in breeding and cultivation to Lao farmers, and present computers and study tools to teenagers and gifts to disadvantaged households. On the occasion, the group will also build a library for Nakhuoai primary school in Saysettha district. Speaking at the launching ceremony, Deputy Secretary of the chapter Tran Anh Tuan stressed that the organisation has made thorough preparations for the activities, affirming that this will contribute to further tightening the friendship between the two nations. Volunteers said they are pleased to join the campaign, which they hoped will help improve the living standards and increase incomes for Lao nationals.